The one indisputable characteristic of my work, play and love experiences today, is that it’s all fueled by learning. In this time of rapid change, one must continue to skillfully, responsibly and habitually learn. To choose not to learn, one can only go backwards today. 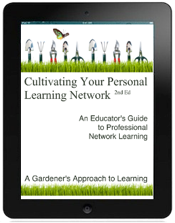 This fact was appropriately demonstrated as I produced this 2nd edition of Cultivating Your Personal Learning Network, the first book that I have written that was explicitly designed for digital publication. Learning to use new software, to code in new programming protocols and refine my skills at animation were just a few of the skills and techniques I learned in the making of this book. In the same way that a garden is a rich and intertwined ecosystem where plants, air, soil, birds and bugs interact to grow and reproduce, today’s emerging information landscape is an info-system, where content is produced, published, accessed, consumed, discussed, re-mixed and re-published. To be a “master learner” — to be a teacher — today, you must learn to work the info-system in order to cultivate new knowledge and skills from a continual flow of information. 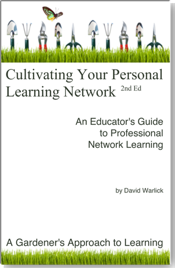 This book is a guide for teachers who seek to model for their students the practices of lifelong learning. 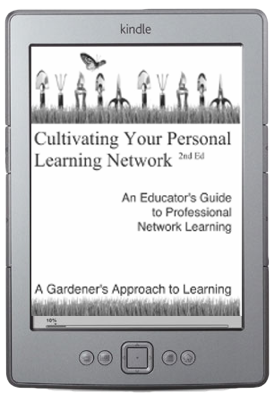 A Gardener’s Approach to Learning is my most recent self-published book, and it reflects several years of research, thinking, and conversations with other network works, identifying techniques and tools that educators are using to cultivate their own personal learning networks. One of the unique features of this book is the presence of QR-Codes. These are two-dimensional bar codes that can be read with smart phones, automatically loading video tutorials related to the current topics of the book.